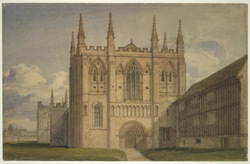 This watercolour depicts the west front at Selby Abbey in Yorkshire. Selby was founded as a Benedictine monastery in the 11th Century. It was the first monastery of its kind to be built in northern England since the Norman conquest. The abbey, originally constructed of timber, was eventually replaced by the present stone building in the 12th Century. The monastery was eventually demolished following the Dissolution of the Monasteries in 1539. Although the Norman-style interior remained intact over time, there were a number of rebuilding projects, such as those carried out by Gilbert Scott in the 19th Century.